Preheat oven to 220°C (425°F). Place the pastry on a large oven tray lined with non-stick baking paper. Using a small sharp knife, gently score a 2cm border around the edge of the pastry and prick the centre with a fork. Place the milk and half of the feta in a small food processor and process until smooth. 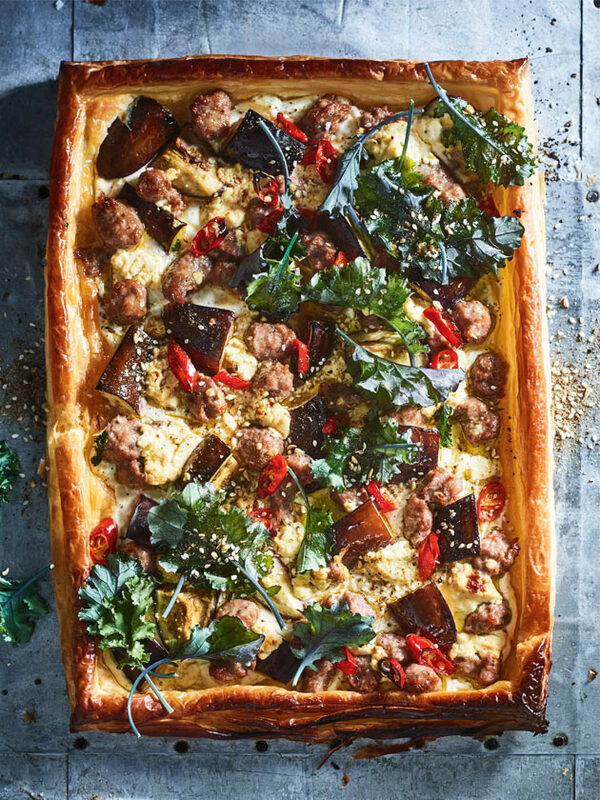 Spread the feta mixture over the pastry and top with the eggplant, sausage and chilli. Crumble over the remaining feta and cook for 18–20 minutes or until golden and pastry is cooked on the base. Top with the kale and dukkah to serve. Serves 8. + If you can’t get a single sheet of 375g puff pastry, place two sheets of puff pastry together, overlapping by 4cm. Using a rolling pin, roll the sheets together to secure, then trim the edge.